Distressed jeans, distressed rug, what’s the connection? Distressed jeans are new, but made to look used. 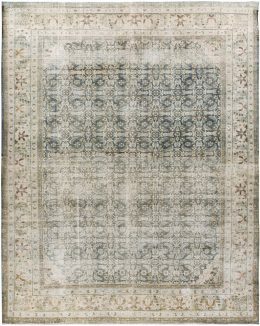 Distressed rugs, on the other hand, may in fact be old, but not the right kind of old. So, they are “improved” to get the right kind of aged look through chemical treatment and careful abrasion. The result is that colors lighten, palettes simplify and wear becomes evident. They look like they’ve been around the block a few times, but almost paradoxically they seem fresh and versatile in modern contexts. In current lingo, they are the coolest floor coverings around. A distressed carpet is not an abused one, but one that has been artfully recreated to follow current decorating style trends. Lida Lavender’s distressed carpets are durable, quality creations with plenty of life in them and are ready to enhance any up-to-date room. Contemporary interiors are all about crisp lines with everything sharp and precise, whether it be in overall design, furniture, artwork or secondary decorations. 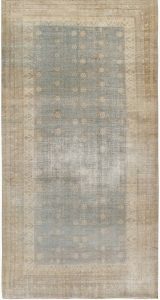 Distressed carpets are seemingly just the opposite and this contrast really works well. In a modern apartment or loft chrome furniture on a distressed rug looks great. In current lingo, they are the coolest floor coverings around. This effect is lost if one substitutes a typically toned antique or new oriental carpet. The worn carpet looks sloppy and the new rug seems harsh. Of course, not every interior profits from the distressed carpet look. 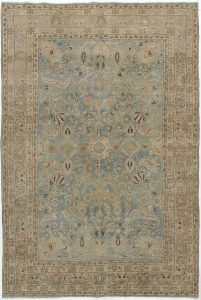 But at Lavender Oriental Rugs our large collection of distressed pieces in various sizes and formats may have just the thing to complete your dream room.